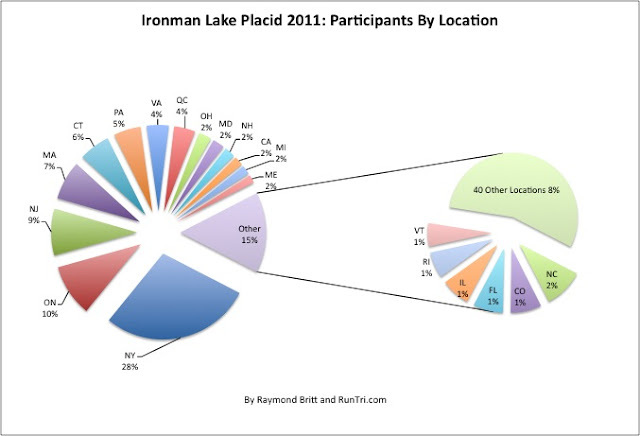 Ironman Lake Placid is one of the toughest Ironman races in the world. With a tight swimming venue, challenging elevation swings on the bike course, and a tough run course, racers are pushed to their limits in Lake Placid. 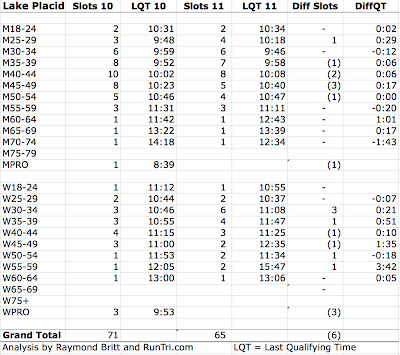 I've completed this race six times (1999, 2002, 2003, 2004, 2005 and 2007), and covered the race from end to end in 2010. 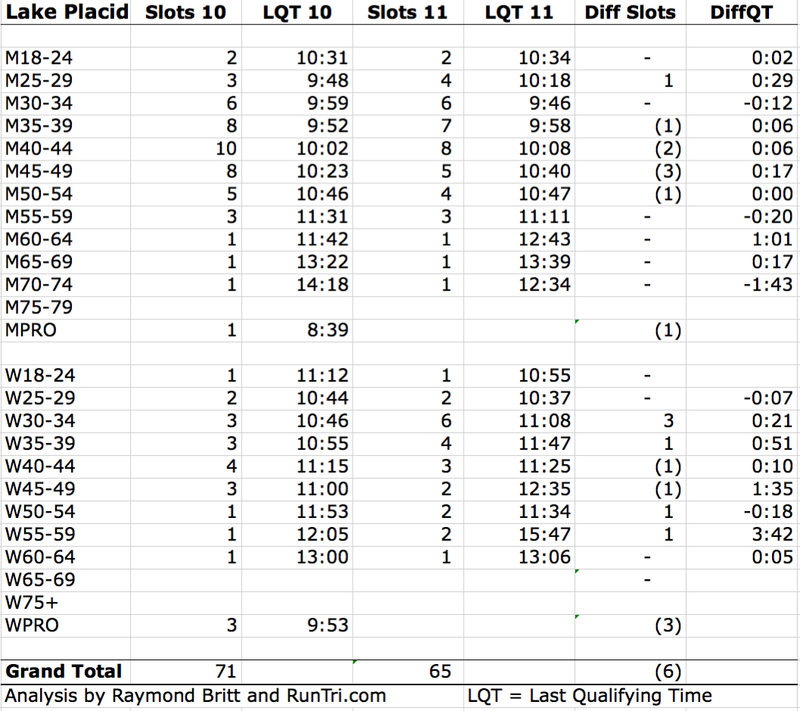 Believe me: finish this race, and you'll deserve to be very proud. These links (excerpts from the book Ironman Lake Placid) will lead you to just about anything you want to know about Ironman Lake Placid. 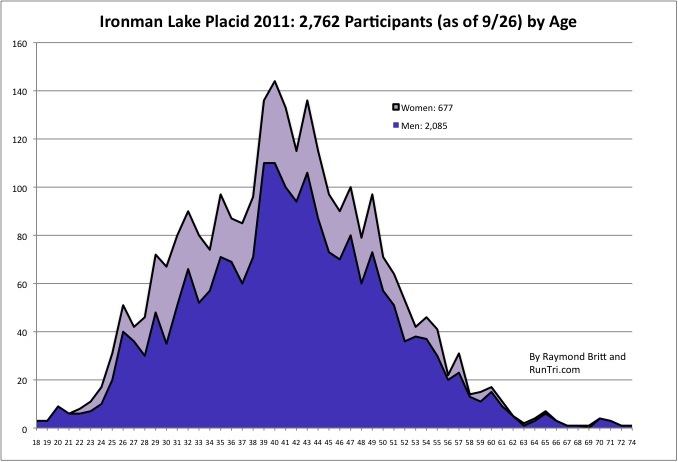 More than 2330 triathletes (after an estimated DNS = 14% and DNF = 6%) finished Ironman Lake Placid 2011 in an average time of 13 hours, 4 minutes. This result places Lake Placid among the more challenging Ironman events in our rankings. 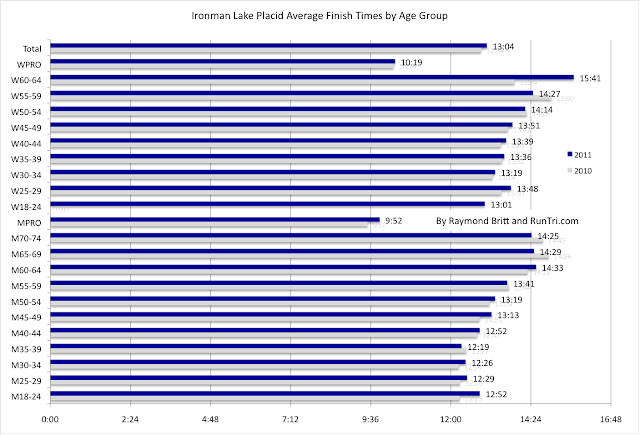 Compared with 2010 results (gray bar), 2011 overall average times per age group (blue bar) were generally slower across the board. Ironman Lake Placid Kona Qualifying times were also slower in many age groups, compared to 2010. 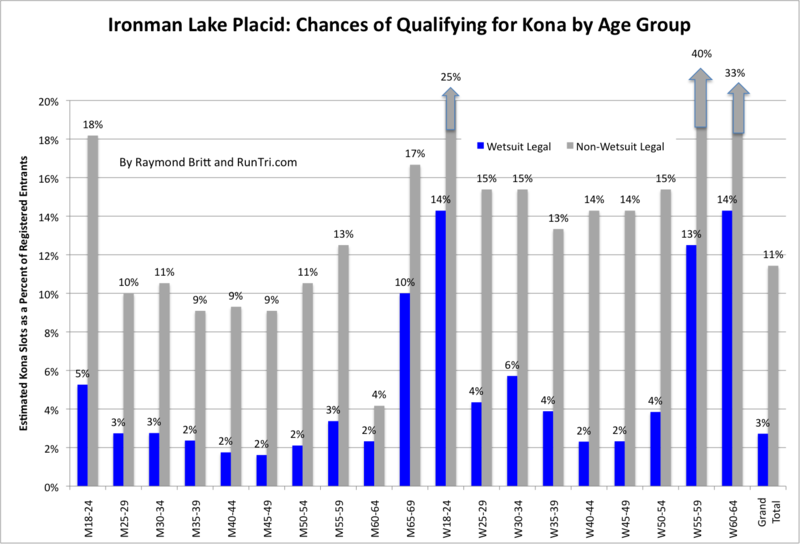 A new 'no wetsuits allowed' policy was enacted in 2011 for those who raced to qualify for Kona. It made for some interesting comparisons. 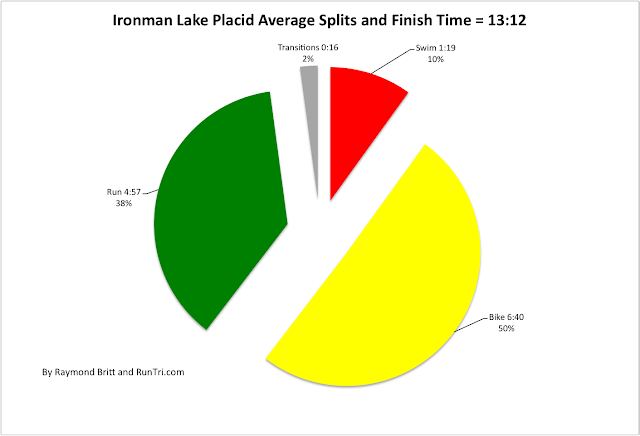 The overall 13:04 average finish time included a 1:18 average swim, 6:36 average bike split, and a 4:52 average run split, with the remaining time spent in transitions. 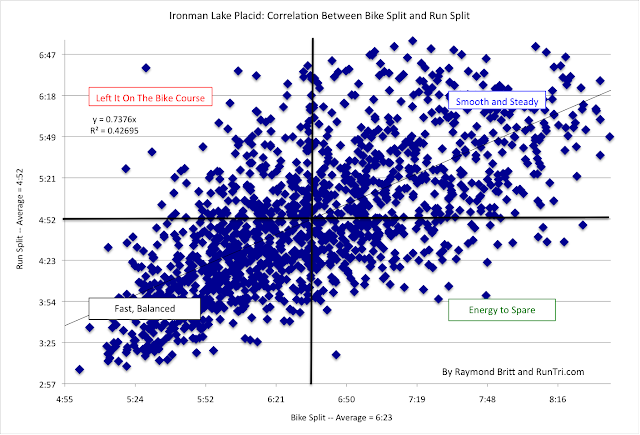 The bike course can be ruthless, with its effects made apparent on the run. The chart below plots each finisher's bike split (x) and run split (y); those in the upper left quadrant are the ones who biked too hard and suffered as a result, on the run. The participants' age distribution and entrant location charts; full results are at ironman.com. 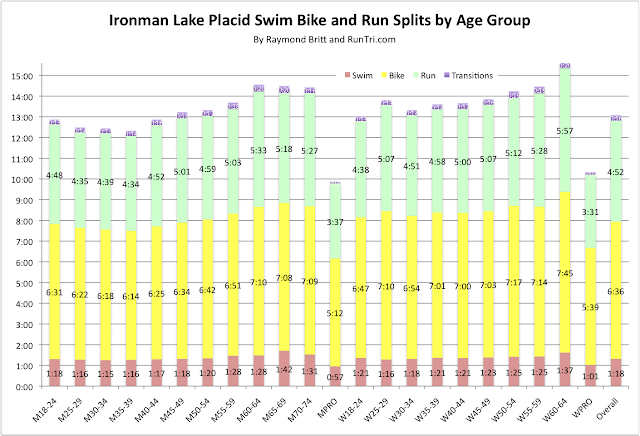 For more, see our Complete Ironman Lake Placid Coverage.